The Ugbajo Itsekiri USA Incorporation Scholarship Scheme held its 2nd Town Hall Meeting providing another opportunity for the beneficiaries and stakeholders to evaluate the programme. The Town Hall Meeting which held at Warri Club, Warri South Local Government Area, Delta State, is the 2nd so far since the inception of the programme. The interactive session was used to evaluate, highlight and discuss the activities of the Ugbajo Itsekiri USA Incorporation Scholarship Scheme and success recorded so far. Speaking at the meeting, the President, Ugbajo Itsekiri USA INC. Scholarship Scheme, Mr. Kingsley Onuwaje said, “all comments/recommendations is all valid and will be shared with other board members abroad. One of our major problem is communication, it’s why we added our official number to the Ugbajo website”. Onuwaje encouraged the beneficiaries to be computer literate so as to bridge the gap of communication between them. He also noted that education is the priority of the Ugbajo Itsekiri USA Incorporation Scholarship Scheme. Speaking in the same vein, Vice President, Ugbajo Itsekiri USA Incorporation Scholarship Scheme, Rebecca Isa said, “we are made up of Itsekiris from 10 regions in the USA, we came to review the scholarship that we have been giving out in Nigeria, the challenges, the benefits and the way forward". She explained that the scholarship is meant for the less privilege in the Itsekiri communities and encouraged the beneficiaries to take their studies seriously and stay away from cult activities. The Coordinator, Nigeria, Ugbajo Itsekiri USA INC. Scholarship Scheme, Sir A.S. Mene said, “it’s a running programme which has been on for about 10 years. The Town hall meeting is aimed at discussing the journey so far, its challenges and how the programme can be improved”. He appreciated the stakeholders and encouraged the beneficiaries to remain focus. The President of INYC, Comrade Agbateyiniro Weyinmi, appreciated the Ugbajo Itsekiri USA INC. Scholarship Scheme for the education opportunity given to the less privilege, noting that many people in Itsekiri Nation are richer than them, but do not deem it fit to help the less privilege in the Itsekiri communities. According to him, “the Ugbajo Itsekiri USA INC. Scholarship Scheme have confidence in the INYC that’s why they gave us the task to pick out those that have benefited from the 500 dollar scholarship scheme”. He appealed to them to increase the number of beneficiaries. 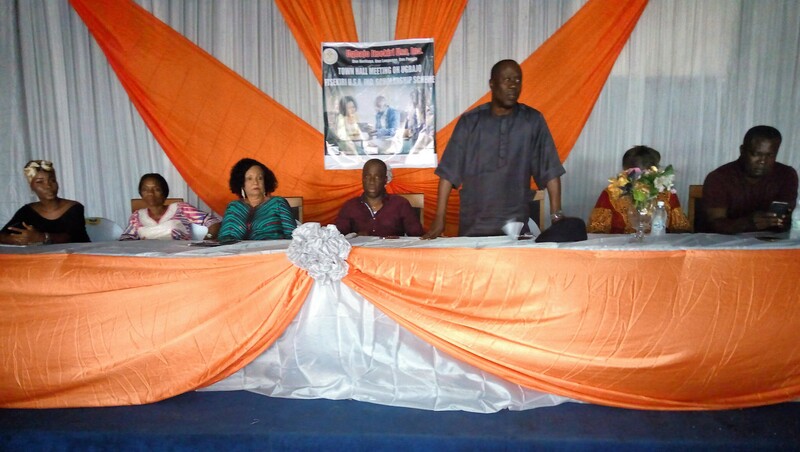 National President, National Association of Itsekiri Students, NAIS, Comrade Norman Komeju Nora gave her observation on the scholarship scheme, thanked the Ugbajo Itsekiri USA INC, her fellow Itsekiri students present at the meeting and appealed to them to help the NAIS with fund to assist other itsekiri students in tertiary Institutions that are not under the Ugbajo Itsekiri USA INC. Scholarship Scheme. 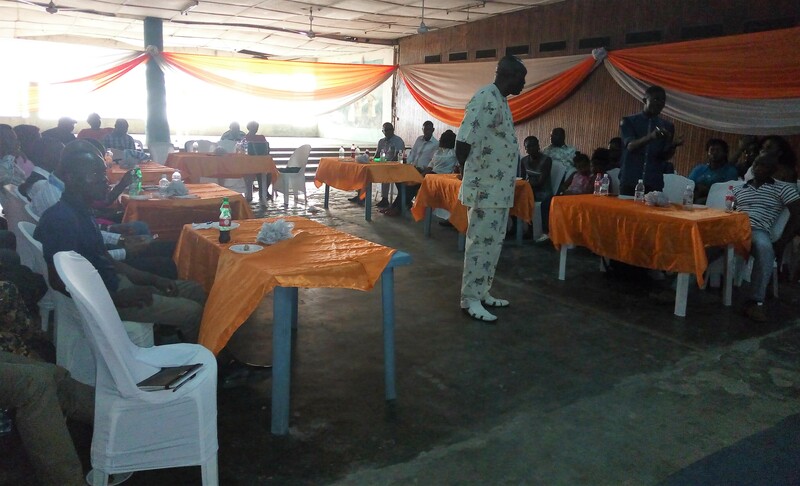 Some beneficiaries who spoke at the meeting, thanked the Ugbajo Itsekiri USA INC. for their good gesture and recommended that skill acquisition programme, scholarship to law school as well as scholarship abroad be included in the programme, especially those studying sciences.